My father gave me a horse. But it was so wild he threw me every time. 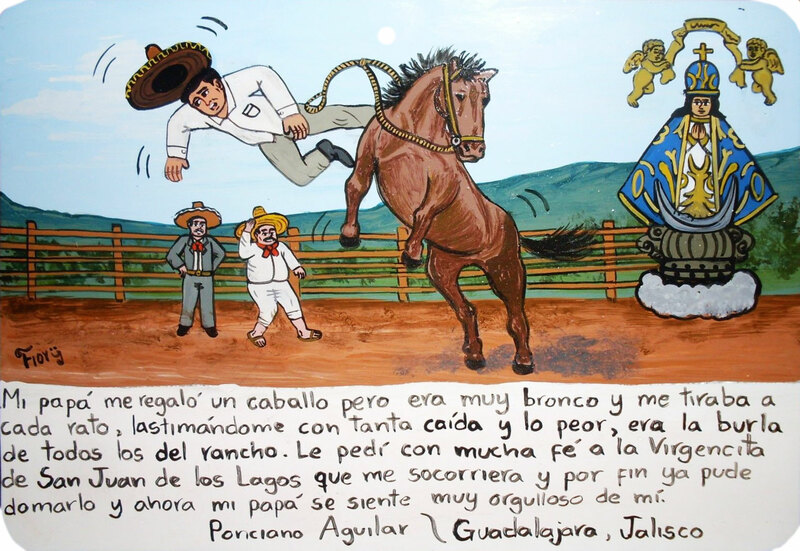 With every fall I hurt myself, but the worst was that I became a joke for everybody at the ranch. I ask the Virgin of San Juan, with all my faith, to help me. Finally I managed to tame the horse. Now my father is very proud of me. I’m not a good football player but since I’m the son of the team owner the coach always keeps me on the bench. The other day, during a very important match, the forward of my team was injured and I was put to play. 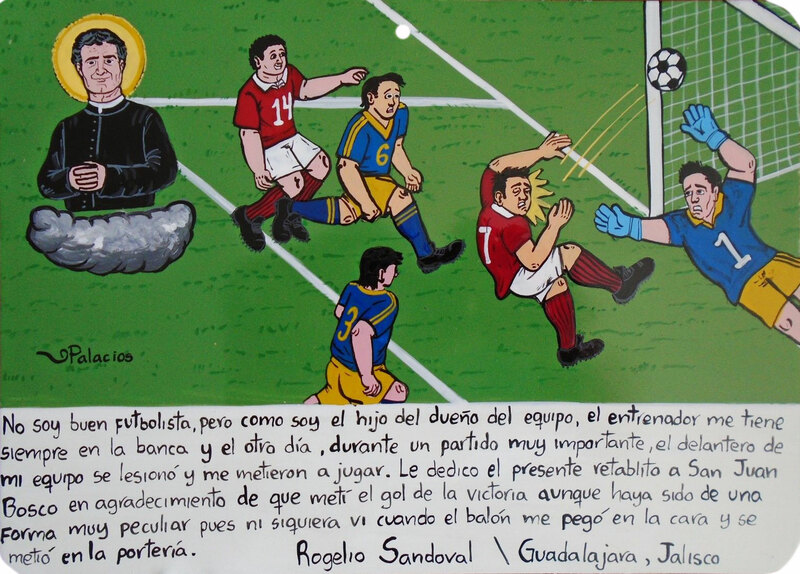 I dedicate the present retablo to Saint John Bosco in gratitude for I scored the victory goal although I did it in a very peculiar manner since I didn’t even see the ball coming. It hit me in the face and went into the goal. A monster began to appear in the Laurita Rios’ closet. She was very frightened and prayed the Virgin of the Rosary so that the monster wouldn’t come back. 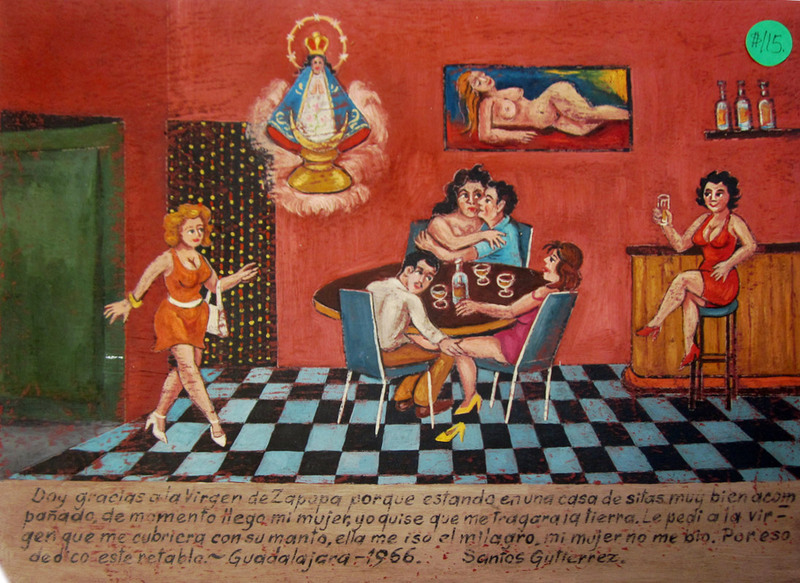 Thanks to the Holy Virgin the girl’s father got a better job in Guadalajara so they moved there. Laurita thanks the Virgin because there are no monsters in the capital. My life was very sad and unhappy. I had no job or anything to call my own. 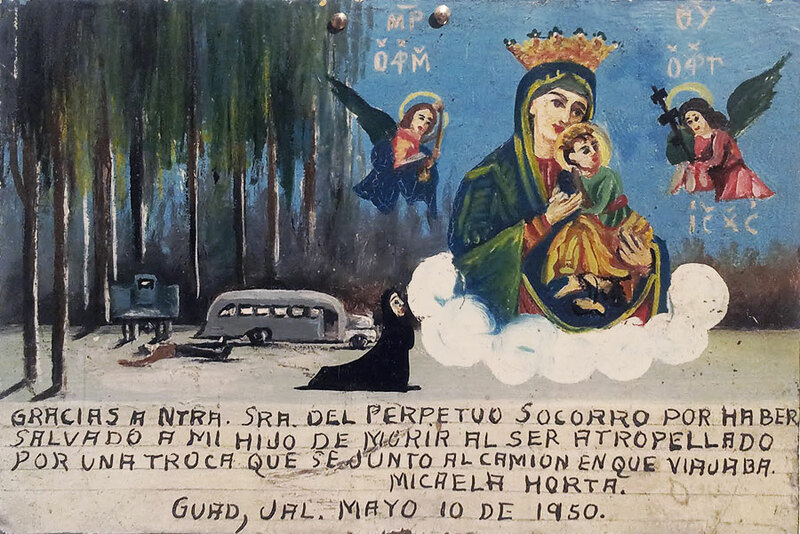 I thank Saint John Bosco with this retablo because one day my remote uncle whom I didn’t even remember left me a big inheritance completely changing my life. Now my devoted dog Fido and I are enjoying the pleasures of life. I thank the Virgin of Zapopan. When I was in a dating house with a great company, suddenly my wife came in. I wished the earth would swallow me up and asked the Virgin to cover me up with her cloak. The Virgin made the miracle, and my wife didn’t see me. 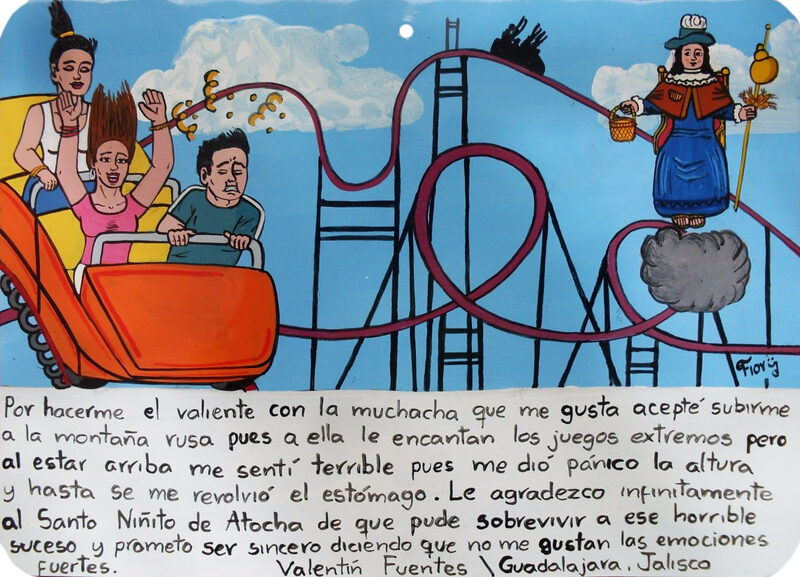 I dedicate this retablo for that. 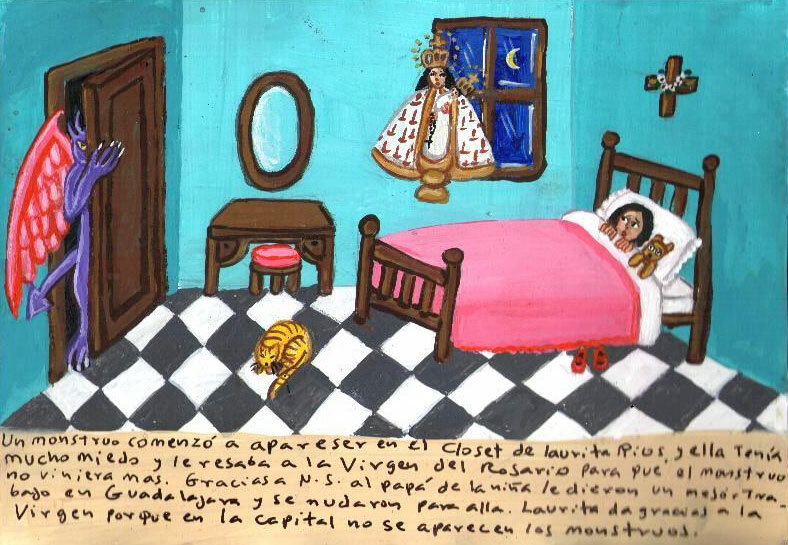 Delfina Hernandez dedicates this humble retablo to Saint Barbara in sign of gratitude for her master pays her very good for her discretion so she won’t tell her wife about his infidelity, when he brings home young girls taking advantage of his wife’s absence. With this extra-money, she could help more to her family which stays back in her village. 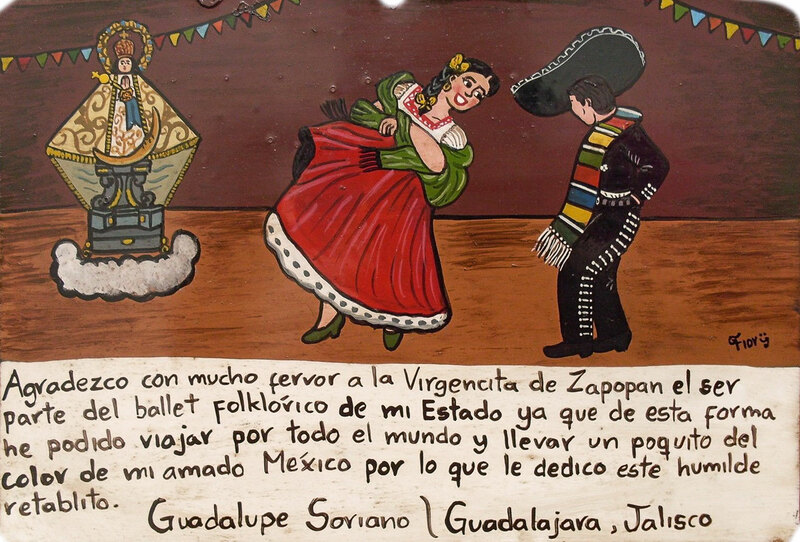 I thank the Virgin of Zapopan for being a part of the folk dance group of my state. In this way, I’ve been able to travel around the world and to show a little bit the colors of my beloved Mexico. 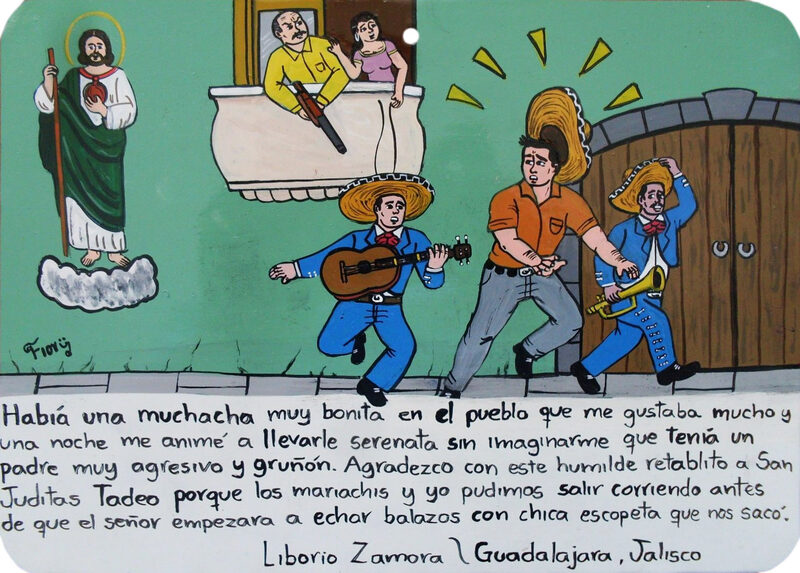 I dedicate this humble retablo for that. 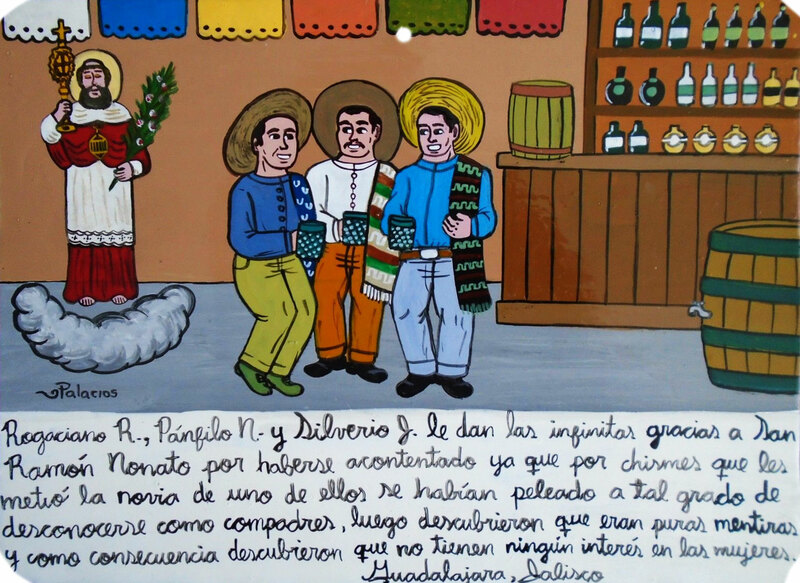 Rogaciano R., Panfilo N. and Silverio J. thank Saint Raymond Nonnatus for having finally made up. The girlfriend of one of them was spreading some rumors which led to a huge fight between them. They didn’t want to know each other. But then they found out it was only a lie. As a consequence, they realized they don’t have any interest in women anymore. 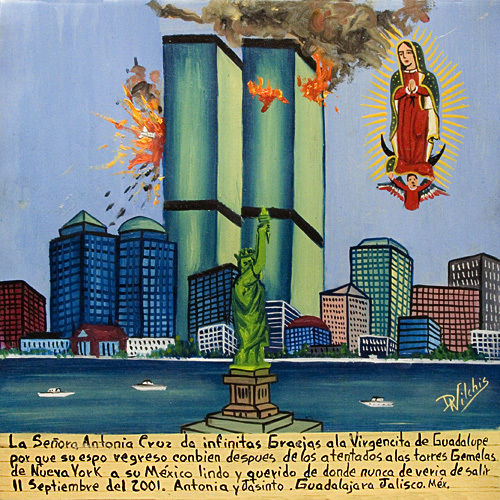 Antonia Cruz thanks the Virgin of Guadalupe because after the attack on the twin towers in New York her husband safely returned to beautiful and beloved Mexico which he should never leave.